US Buyer? Check out 3 Man Chess on Amazon for better shipping rates! International Buyer? Be sure to compare shipping in your location on CoolStuff & MasersOfGames as well! The board’s true wood rendered image is digitally printed directly onto a 19 1/8 inch (485mm) diameter, 1/8 inch (3mm) thick round piece of extruded PVC that has been cut & hinged with a Polyken chemical resistant tape to fold into thirds. This our 4th generation, and best board yet. The pieces are black, gray, and ivory in color. 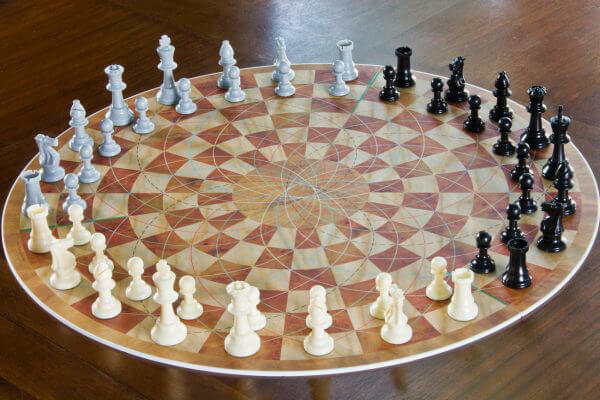 Each set of game pieces, consists of 48 pieces comprising 3 teams of 16 pieces each. All pieces are solid plastic with felt bottoms. Kings are 2.5 inches (64mm) tall, with a 1-inch (25mm) diameter base. Orders placed by 6PM CT today will ship the next business day. We ship to the address you enter at checkout. If you make a mistake, email king@3manchess.com ASAP. 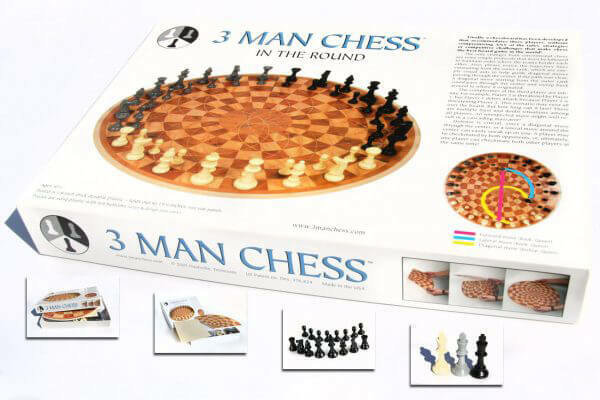 Check out 3 Man Chess on Amazon - might be better shipping rates! CoolStuff.com carries the game, & may have better shipping rates to Sweden, Germany, Norway, Denmark, Finland and many other countries. MastersOfGames.com ships 3 Man Chess from England. Sometimes with international orders, if no one is home, they may wait a week before attempting another delivery. If you don't receive it soon, please call your local post office. Allow 5 extra days for Brazil orders. If you are not home during the attempted delivery, your local Brazil Post Office will keep the game until you come and pay an import tax. If your game hasn't arrived in 2 weeks, that's probably where it is.